The project Car Throttle is working on right now is pretty darn interesting. 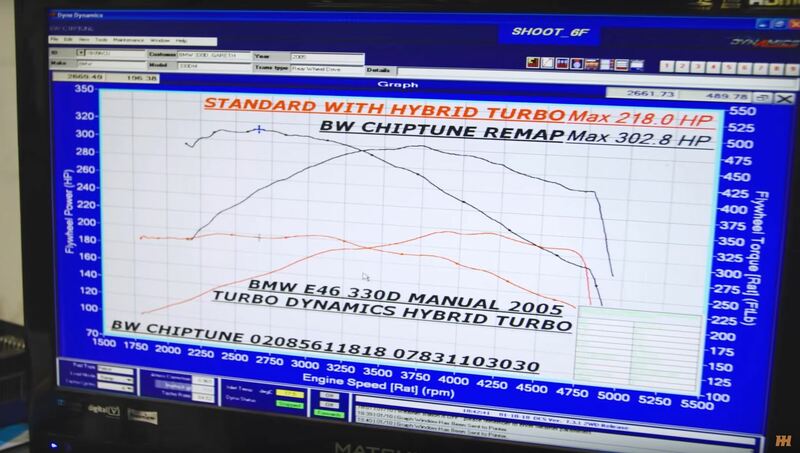 They set out with a standard, pre-owned BMW 330d Touring (E46) to try and beat a BMW E92 M3 on the track. The process would involve a lot of tuning, as you can imagine, as an M car isn’t all that easy to beat on the track, especially considering the cars going at each other here. Over the course of the last two months we’ve been following their work and things have been interesting, to say the least. After changing the dampers, coilovers, wheels, tires, brakes and even bushings, the guys started doing some more serious work, to save as much time as possible. The car was stripped out to save weight and make it faster round the track while the engine got a small power upgrade from a piggyback tune. It wasn’t enough to show a serious improvement on the track though and therefore a different approach was needed. They decided a hybrid turbo would be the way to go. Before you watch the video I’m going to do you a favor and tell you that a hybrid turbo is not what you may think. While the word ‘hybrid’ may instantly trigger some thoughts about electricity and/or a compressor being thrown in the mix, it’s not remotely that. Instead, a hybrid turbo is basically the same turbo with different propellers and some upgrades done to it. The guys explain what it is quite accurately, basically keeping the original exterior dimensions of the turbo but improving its internals in order to allow it to spin faster and therefore carry more air through it. Did it work? Well, you should know that in order to make it work, a lot of changes need be done to the car. From changing the clutch (and possibly the flywheel too) to eliminating the EGR and also adding a new exhaust, something the guys didn’t do. In the end though, there’s a lot more potential here, even though the car put out over 300 HP and nearly 500 lb-ft of torque after getting a proper ECU map to handle the changes done to it.